Brett Moist/ for the Northwest Herald Woodstock North's Josh Jandron knocks the ball out of the hands of Wauconda's Ricky Sidlowski during the 4th quarter of their day one matchup of the 64th annual E.C. Nichols basketball tournament at Marengo High School on Saturday. 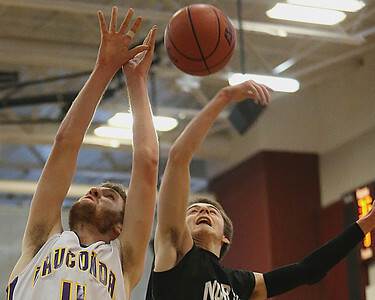 Brett Moist/ for the Northwest Herald Wauconda's Dion Head drives past Woodstock North's Kyle Solarz during the 3rd quarter of their day one matchup of the 64th annual E.C. Nichols basketball tournament at Marengo High School on Saturday. 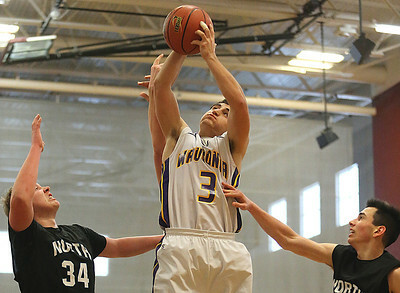 Brett Moist/ for the Northwest Herald Wauconda's Joey Lovelle dives above Woodstock North's Doug Devore (left) and Riley Basaran (right) during the 3rd quarter of their day one matchup of the 64th annual E.C. Nichols basketball tournament at Marengo High School on Saturday. 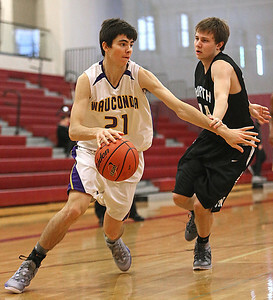 Brett Moist/ for the Northwest Herald Wauconda's Matt Bulgarelli drives past Woodstock North's Evan Peterson during the 3rd quarter of their day one matchup of the 64th annual E.C. Nichols basketball tournament at Marengo High School on Saturday. 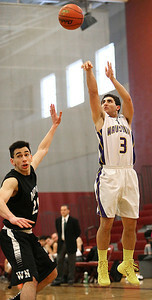 Brett Moist/ for the Northwest Herald Wauconda's Joey Lovelle shoots a 3 point shot over Woodstock North's Riley Basaran during the 4th quarter of their day one matchup of the 64th annual E.C. Nichols basketball tournament at Marengo High School on Saturday.